I have not much to wear. If you remember, I dumped 3/4ths of my closet and sent it to Goodwill. I think I dumped too much. Then again, I grew tired of all that I donated. Well now, out of the 1/4 left – the weekend wear is great with blue jeans and t-shirts. But work wear – I have nothing left. Or so I decided to find out – do I have nothing to wear or is it I don’t want to wear anything I have. Pen and Paper, I scribbled down all that I own (except the socks and underwear). Closet – done, shoes – done, drawers – done. I listed everything in spreadsheet. 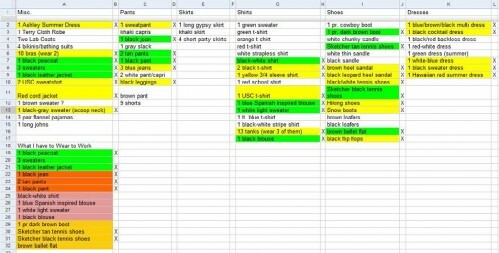 The categories listed: Miscellaneous, Pants, Skirts, Shirts, Shoes, and Dresses. Added checkmark next to everything I wear. (Click on pic to enlarge) Looks like I have much more to rid of – if its in ‘white’, chances are I haven’t worn it in over a year. 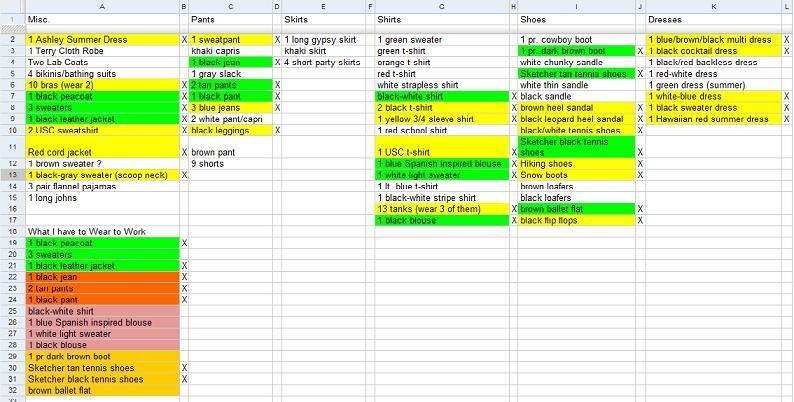 Copy and pasted the work clothes, that I actually don’t mind wearing (green coded), together at bottom of spreadsheet. Then, again I separated the categories in other multicolors. Conclusion: What a boring gal I am and totally not put together. No wonder I feel like I have nothing to wear to work, because I really don’t! Go buy me 3-4 pairs of new pants (for work), 3-4 new long sleeve button up blouses, and 1 pair of black shoes (I like) on my 30% off coupon (plus the pants I want are on sale, too). I think I can pull this off for less than $200. I think buying quality pieces is suitable for pieces I would be wearing often. Be happy that I have a full line of clothes to wear to work without feeling like a bum and confidently revamp my lead status at work, too. So, have you organized your closet lately? This entry was posted in Tutorials and tagged clothing budget on 2010-01-21 by Christine.